Lawrenceville Family Dental Care offers periodontal therapy for those suffering from periodontal disease. Periodontitis is a very serious condition where the gums suffer severe infection. If periodontal disease is not treated with general dental care, it will eventually cause tooth loss and the infection can spread into the blood stream and cause even further health concerns. Periodontal disease begins in the simplest form of gingivitis; when gingivitis does not receive early intervention it will progress and will require the intervention of periodontal therapy. Your gums and your jawbone hold your teeth securely in place. If they receive serious damage from periodontal disease the integrity of your teeth can be permanently damaged. Lawrenceville Family Dental Care offers effective therapy for periodontal disease to restore the health of our mouth and to prevent other irreversible health issues. If you have any signs of gum disease – red, tender, swollen, or bleeding gums – it is essential that you seek treatment as early as possible. Lawrenceville Family Dental Care offers successful treatment for gum disease here in Gwinnett County. Gum disease has been directly linked to many other health problems such as heart disease and diabetes. Dr. Ashish Patel offers exceptional treatment for gum disease in order to restore the health of your mouth and to prevent further complications. Your comfort is always one of Dr. Patel's greatest priorities, and the staff at Lawrenceville Family Dental Care will take care that we are sensitive to your needs and any anxieties that you have regarding oral health care. Please do not let fear keep you from receiving the oral health treatment that you need. Gum infection, when early intervention is applied, can be extremely effective. 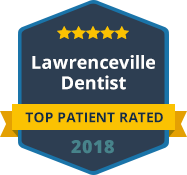 Lawrenceville Family Dental Care is committed to providing the highest standard in oral health to all of our patients. Scaling and root planing are specific oral treatments done in order to combat the effects of gum disease. When these treatments are implemented early on, they can reverse damage and promote healing. Scaling and root planing are used to remove plaque buildup and infection from the gum line and to smooth out the root surface. If you have been diagnosed with periodontal disease or fear that your gums are infected, please contact Lawrenceville Family Dental Care right away. Scaling and root planing are done to remove damaging factors and restore oral health. The entire staff at Lawrenceville Family Dental Care is dedicated to your successful treatment.